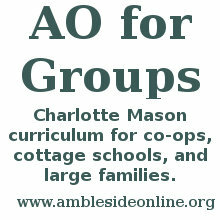 The first year of your co-op or cottage school, everybody would be doing Year A. The following year, everybody would be doing year B. 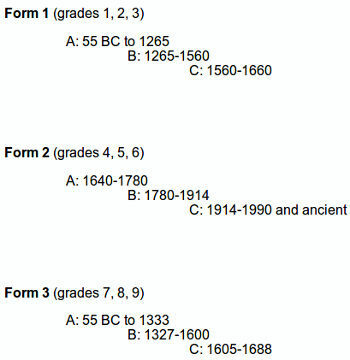 After year C, the cycle starts all over again - but students will have moved up to the next Form by then, so they won't be repeating material. As a group or co-op, you'd start this year with the A plan (although you don't have to, if the history and books for B or C seem like a better starting place for you). Next year, you'll do B, then, C. All the pupils in grades 1-3 will be able to do Form 1 together, grades 4-6 will do Form 2 together, and so on. If a new student joins your group in the middle of the year, or the following year, that student will just join the other children wherever they are in the form. Some students will experience the years in a different order, depending on when they start -- ABC, or BCA, or CAB. That means that history is not always chronological for all the students (there always have to be compromises somewhere). However, the school mentioned above has found that it does work. We believe that making sure a timeline or book of centuries is used consistently so the progression of history is noted and preserved will be of the utmost importance. Families with children close enough in age can group their children by Form. If your oldest two children are 6 and 8, you could do Form 1, year B this year with both of them, and then Form 1C together the following year. When the older child is ready to move into Form 2, the second child begins Form 1, year A (and perhaps there is a younger sibling now ready to join Form 1, year A!). *(And then the next year, Child 1 would be in Form II, and Child 2 would join the older sibling in that year, and so on). It might sound complicated, but we believe it is harder to explain than to put into practice. You can see how this might work here. If you're starting AO with multiple children for the first time, you might need to do two Forms or more, but that would be easier than doing 4 individual years, and that's especially true if you'll be reading much of Form 1 aloud. This is how we think it will work, but we're looking forward to your feedback. The books in each Form are drawn from the AO years, but overall represent a lighter reading plan, and are sometimes arranged differently from the regular AO Years. We designed this with the needs of co-ops and schools primarily in mind. In a family situation, you might find that you have time in your schedule for another book or two, in which case, we suggest looking at the original AO Years and selecting something that we left out of 2.0.